Marshelder also called sumpweed, is a member of the aster family. The domesticated var. macrocarpa is extinct, but the wild variety of the plant still thrives. Today, wild marshelder grows on open, moist, and recently disturbed ground in the flood plain of southern Iowa. Flowering occurs in August, and seeds ripen in October. The flowers are borne compactly on several spikes, and harvesters can easily strip the seeds from the spikes. Marshelder appears in the Upper Midwest as a domesticated plant over 4,000 years ago. Prehistoric people developed wild marshelder into a domesticated variety with larger seeds and greater yields. The size of the seeds increased about 1,000 percent as the result of domestication. 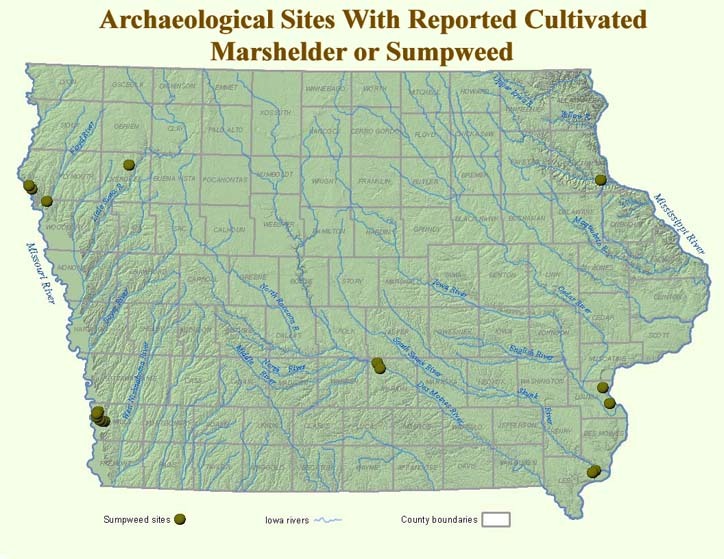 The earliest specimens in Iowa reported as possible cultigens come from a Late Archaic context at the Sand Run West site (13LA38) in Louisa County and at site 13CT228, a Terminal Archaic or Early Woodland site in the Turkey River valley dated to 2,600 years ago. Native people in Iowa grew marshelder into the Late Prehistoric period although its use apparently declined following the introduction of maize. There are no historic descriptions of how it was grown or processed. Marshelder is similar to wheat in that it needs to grow in large amounts in dense stands in order to produce a sufficient crop to be harvestable. The oily seed is covered with a thin, dry pericarp (protective covering) that is difficult to remove. The seeds are a concentrated energy source— high in protein, calcium, iron, phosphorus, potassium, thiamine, niacin, and B-complex vitamins. Its has been discovered mixed with other oily seeds such as squash and sunflower in Late Prehistoric Glenwood storage pits at sites such as Johnson Farm (13ML129) and Kuhl (13ML138) in Mills County. 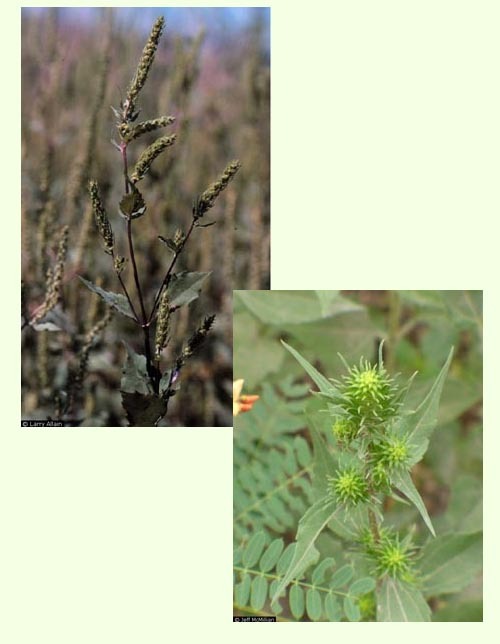 Researchers suggest that the inhabitants at these sites may have used these plants interchangeably, were storing them together for seed, or perhaps had been mixing them to prepare a type of prehistoric succotash.